At Turku’s T hospital, adaptability served as the basis for design. The hospital’s building services engineering and space solutions must offer flexibility. T hospital, which if part of Turku University Hospital, is a significant hospital project on a global scale as well. Its ventilation system’s cooling solutions are not only advanced, but also energy efficient. T hospital’s work and patient areas are open, tranquil and pleasant. Colours are used to offer guidance and to create a soothing and cheerful atmosphere. The exploitation of daylight results in a pleasant and energy-efficient solution. Artificial lighting contributes to a tranquil atmosphere in the waiting rooms and gives a bright feel to the work spaces. Turku University Hospital is at the forefront of design and construction work related to central hospitals’ extension and renovation projects. This makes T hospital stand out from the older hospital buildings, which were built mostly in the 1950s and 1960s. Its design solutions take into account the requirements set by modern hospital services. The gross floor area of the hospital extension is 63,000 square metres. The new premises house some of the hospital’s most challenging spaces and activities in terms of technology, including 14 operating theatres, an intensive care unit, instrument care and maintenance facilities, a cardiology ward and imaging facilities. T hospital has been dubbed a key project in hospital construction. Thanks to its innovative technological and care work-related solutions, it is also at the forefront of its field internationally. Therefore it does not come as a surprise that it has attracted global attention, with visitors arriving not only from neighbouring countries but also from continental Europe and Japan. Continuous adaptation to rapidly developing operations is a typical characteristic of a modern hospital. For these reasons, the new extension’s technical systems were stacked in a structure designed for the purpose, a solution that has proved functional in previous projects. 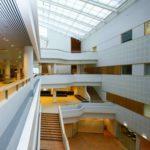 In a modern hospital building, pleasant indoor air requires a high-quality cooling system. Such a system can be used to maintain a comfortable temperature on wards and in public spaces in summer. Cooling devices were installed in operating theatres, examination spaces, patient rooms and laboratories. The hospital’s nerve centre – consisting of its electrical, UPS and telecommunication premises – uses Chiller’s precision air conditioning devices to guarantee consistent conditions. Their energy consumption is maintained at a low level by a novel hot gas heating system developed by Chiller. Collaboration with HVAC suppliers is invaluable in the development of new, even more efficient systems, according to HVAC Design Engineer Juhani Kokko. Companies specialising in certain devices can provide information on the new possibilities offered by the latest technical developments and on the other hand, device suppliers gain new insight into the requirements set by a hospital environment and factors influencing functionality in such surroundings. Each hospital construction project offers a great training opportunity for those involved and increases the Finnish building services engineering expertise in the field of special construction. The Smart close control units make for an ideal choice for challenging applications, such as IT, electronics, measurement and test facilities. The units are equipped with chilled water (CW) and direct expansion (DX) cooling.